I love you. The meeting ran late. I want a divorce. One little word, one casual lie, one devastating announcementand our lives are turned upside down forever. 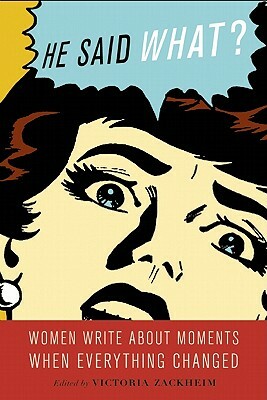 In He Said What?, twenty-six gifted women writers share profoundly personal moments in which a man in their life said somethinggood or badthat changed them irrevocably. Joyce Maynard reveals the profound humiliation and trauma she suffered when, after dropping out of Yale to move in with J.D. Salinger at just 18, he suddenly ordered her to pack her bags and leave. Author and screenwriter Amy Ferris writes about what her father said to her after she dropped out of high school at 15right before she flew across the country to hitchhike her way from San Francisco to an Oregon commune. With additional contributions from Dr. Margot Duxler, Beverly Donofrio, Sherry Glaser, Abby Frucht, Jane Ganahl, Christine Kehl O Hagan, Susanne Dunlap, and Caroline Leavitt, this is a beautifully-penned, intimate collection of stories about the powerful impact that the rightor the wrongwords can have on a person's life.